Over Arsenal’s last 3 home games, Sánchez has registered a shot frequency of 1 every 10.8 minutes (8.3 per game) and created 1 chance every 27 mins (3.3 per game). In GW23, he will have the opportunity to continue this form as he will face a Watford side who have conceded nearly 3 goals per game away from home over their past 6 away games. Furthermore, in his 3 matches against Watford, Sánchez has netted 3 goals, with a shot frequency of 3.7 per game, and also provided 2 assists, with 3.3 chances created per game, so he clearly has everything required to be the top captain pick in GW23. Tottenham are in blistering goal scoring form at the moment, with 16 goals in their last 5 games, and Eriksen has been central to this, with 6 assists over this period. In comparison, Sunderland’s home defence has been porous, conceding 5 goals in their last 2 games at the Stadium of Light. Also, Eriksen has excelled against Sunderland in the past. In his 4 matches against Sunderland, Eriksen has netted 5 goals, with a shot frequency of 4.3 per game, and also provided 2 assists, with 5.5 chances created per game. Thus, this exceptional record and terrific form bodes well for Eriksen owners in GW23. Zlatan is another player who has the potential to return a large haul in GW23. Coming up against Hull, who have the worst away defensive record in the league this season, Zlatan will fancy his chances of netting at least a goal. When Man Utd faced Hull in GW3, Zlatan registered 7 shots, and was unlucky not to score, so he will be out to make sure the same thing does not happen again. Moreover, Ibrahimović has provided returns in 3 consecutive home games, which heightens his appeal this GW. Despite his high ownership, it is likely that Romelu Lukaku will fly under the radar as a captain pick this GW, but it is equally likely that he will be one of the top point scorers. This is because Lukaku and his side are currently in superb form. Everton are averaging nearly 3 goals per game over the last 5 GWs, and Lukaku himself has been involved in 3 goals and 1 assist during this period, with an average of 3 shots per game. Furthermore, Lukaku has excelled against Stoke in the past, with 3 goals in his past 3 games against them, as well as an average of 3.7 shots per game and 3.3 chances created per game. Therefore, if Lukaku can build on his current form and display the attacking quality which has seen him do well against Stoke in the past, there is no reason why he can’t return a large haul in GW23. Over the past 3 GWs, Nathan Redmond has been one of the stand out players stats wise. Over this period, he has managed a shot frequency of 1 every 23.5 minutes, which is almost 4 per game. He also registered 1 goal and 5 shots inside the box against Liverpool in the EFL Cup Semi Final 1st Leg, which set his side up for the victory. In GW23, he will face the league’s worst defence in Swansea, so he should have plenty of opportunities to turn these impressive stats into FPL returns. It is worthy noting that earlier in the season, Redmond had 4 shots against Swansea and also created 4 chances, so he not only has the potential to perform well, he has shown that he can really trouble the Swans defence. Regardless of the fact that he has been shifted back to left back from left wing, Brunt still has great potential this GW due to clean sheet and goal/assist capabilities. He will face Middlesbrough, who have the worst attack at home this season, while his side have the 5th best home defence, so a clean sheet is a definite possibility. In fact, West Brom have kept 5 consecutive clean sheets against Boro. Additionally, over the past 2 games where he has played 60+ minutes, Brunt has 2 goals and an average of 10.5 points per game, which promises well for his owners. Also, in his last 3 games against Boro, Brunt has 3 goals, and he netted a brace the last time this exact fixture was played. Hence, Chris Brunt clearly has what it takes to be a sneaky punt captain pick in GW23. Despite his miserly price tag and ownership, Josh King has the potential to return a large haul this GW. In his return to the starting line up last GW at home to Watford, King netted a goal and registered 4 shots. This performance is very promising, and given that Bournemouth has scored 5 goals in their last 2 home games and averaged 14 shots per game over this period, King should have plenty of chances to reward his owners in GW23. Despite the uncharacteristically poor season that David Silva is having in terms of FPL returns, he has thrived against West Ham. In his 2 matches against the Hammers this season, Silva has netted 1 goal, with a shot frequency of 4 per game, and also provided an assist, with 3 chances created per game. This signals well for Silva owners, especially given his FA Cup performance against Crystal Palace, when he completely dominated the match. Subsequently, if he can continue this form into GW23, Silva has the potential to build on his previous top performances against West Ham. Coming off the back of a dramatic win against Burnley last GW, Arsenal will be looking to have the 3 points in the bag much earlier when they play Watford at home in GW23. In the last 3 Premier League meetings between these sides, Arsenal have netted 10 goals (3.33 per game). This brings Alexis Sánchez (£11.9 – TSB 37.6%), Mesut Özil (£9.5 – TSB 7.3%) and Aaron Ramsey (£7.6 – TSB 1.0%) into contention for FPL points, and also Theo Walcott (£7.4 – TSB 4.4%), who returned from injury in the FA and netted a hat-trick. In addition, Arsenal have not conceded a goal to Watford at their home ground since 1998, so FPL returns for Arsenal defenders, particularly Laurent Koscielny (£6.3 – TSB 18.1%) also seem likely going off past meetings. However, Watford do possess some quality attacking players in their side, namely Tom Cleverley (£5.1 – TSB 0.1%), M’Baye Niang (£6.0 – TSB 0.0%) and Stefano Okaka (£5.3 – TSB 0.1%), so if these players can make an impact and pick up from where Watford left off last GW away to Bournemouth, they may be able to pressure Arsenal and make it tough for the Gunners. It is also worth noting that the Gunners are more prolific on the road this season and at times have struggled to break teams down when playing in front of their own fans, so they will have to be at their best to beat Watford this GW. After close games for each side last GW, both Bournemouth and Crystal Palace will be out to pick up a win in GW23. For Bournemouth, a win could see them move into the top half. As a result, Benik Afobe (£5.6 – TSB 0.8%) and Joshua King (£5.3 – TSB 0.7%) could be ones to look out for, as they will no doubt be threatening the leaky Eagles defence with their attacking prowess. For Crystal Palace, picking up a win is of immense importance after falling into the drop zone last GW. Central to their efforts for victory will be Scott Dann (£5.2 – TSB 2.9%), who has 2 goals in his last 2 games against the Cherries, as well Jason Puncheon (£5.2 – TSB 0.7%) and Löic Remy (£6.3 – TSB 0.2%). Confidence will play a big part for both sides in this match. On one hand, Burnley’s confidence would be high after their recent performances. In the last 5 matches, they have registered 3 wins, all coming at home. In fact, Burnley have the 4th best home record in the league this season. The other 2 matches were both 2-1 losses, to Manchester City and Arsenal, where the Clarets put in performances worthy of a victory. As a result, Tom Heaton (£5.0 – TSB 17.7%), who has 2 clean sheets in his past 3 home games, and Andre Gray (£6.2 – TSB 5.3%), who has 6 goals in his last 6 games in all competitions, both are full of confidence at the moment and may be thorns in the side of Leicester. On the other hand, Leicester are currently lacking confidence. They have lost back to back PL games 3-0 and then almost lost to Derby in the FA Cup. As a result, this game could be the one to end Leicester’s 10 game unbeaten run over Burnley. West Brom come into this match on the back of some excellent form and also a dominant record over Middlesbrough. 3 wins in their last 4 games, as well as an unbeaten record against lower placed opposition since GW4 has resulted in the Baggies sitting 8th on the table (2nd after Everton excluding the ‘Big 6’ teams). This period has seen the rise of Matty Phillips (£5.9 – TSB 21.5%), who has 4 goals and 9 assists this season. Furthermore, West Brom’s record against Boro makes them overwhelming favourites in this match. The Baggies have kept 5 clean sheets in their last 5 games against Boro, scoring 11 goals and picking up 4 wins. Therefore, Chris Brunt (£5.0 – TSB 2.8%), who has 2 goals in his last 3 games, and also Gareth McAuley (£4.9 – TSB 27.9%), who has 1 goal, 1 assist, and 3 BPs in his last 3 games, are both stand out FPL options at the back this GW. This game involves teams in two completely different situations. Sunderland are currently sitting rock bottom on the ladder, with 7 losses in their last 10 games, conceding 2.1 goals per game over this period. In comparison, Tottenham are on a 7 game unbeaten run, and have netted 26 goals in their last 8 games (3.25 per game). Moreover, Spurs are unbeaten in their last 13 PL matches against Sunderland, picking up 10 wins and scoring 23 goals. It is worth noting though that in this run, Spurs have only kept 5 clean sheets. As a result, Harry Kane (£11.2 – TSB 19.9%) and Christian Eriksen (£8.7 – TSB 16.4%) look particularly appealing FPL assets in this match. For Sunderland, the only player who could be considered for a place in our starting teams is Jermain Defoe (£7.9 – TSB 28.5%), who has scored 12 goals this season (4 in his past 4 games), and may be motivated by the ‘old club factor’ to score against Tottenham. Last GW, Swansea put in one of, if not their best performance of the season against Liverpool away at Anfield. Key to their success in this match was Fernando Llorente (£6.1 – TSB 3.8%) and Gyfli Sigurdsson (£7.2 – TSB 5.3%), who together won the match for Swansea. Tom Carroll (£4.2 – TSB 0.5%), who picked up an assist on debut, will also be pivotal to Swansea’s attacking play, and if afforded the no. 10 position, could be a player who performs well above his FPL price tag. Subsequently, these players will again need to play well if Swansea are to get anything out of this match. Their opposition, Southampton, returned to winning ways again Leicester in GW22, and then backed it up in the EFL Cup with another 1-0 victory over Liverpool. They too will be in search of all 3 points, and this could be possible because of two reasons. Firstly, Swansea have the worst defensive record at home this season (27 goals conceded), making Shane Long (£6.1 – TSB 3.1%), Dusan Tadić (£7.0 – TSB 1.4%) and Nathan Redmond (£5.8 - TSB 5.0%) ones to look out for. Secondly, Southampton have kept 4 clean sheets in their past 4 visits to the Liberty Stadium, bringing Ryan Bertrand (£5.4 – TSB 1.2%) onto the radar of FPL managers. Therefore, a victory for both sides will be very important, and this game should be a very close encounter. Liverpool have slipped further back in the title race as they are without a win in 3 games. A loss could see them drop to 5th, but a win could see them move back into 2nd. Central to their efforts for victory will be the rejuvenated Roberto Firmino (£8.4 – TSB 11.2%), who scored 2 goals from 6 shots in GW22 and also Philippe Coutinho (£8.3 – TSB 18.7%), who bagged a brace against the Blues last season. Gini Wijnaldum (£7.5 – TSB 1.3%) could also be one to keep an eye on in this game, having picked up 16 points in his last 2 home games. Moreover, Liverpool will gain confidence from their record against Chelsea, as they are unbeaten in 6 games against the Blues. For Chelsea, 3 points will keep them on track for the title. However, a loss will place great pressure on them, especially considering that their nearest rivals, Arsenal (2nd) and Tottenham (3rd), have ‘simple’ fixtures. If they do lose, their lead could be reduced to 5 points, with the possibility of 2 points if they lose again to Arsenal next GW. Consequently, Chelsea will place great enormity on this match, and Eden Hazard (£10.3 – TSB 31.6%) could re-discover his goal scoring touch this GW. Therefore, the result of this match will have significant implications for both sides and it should be a hard fought game. 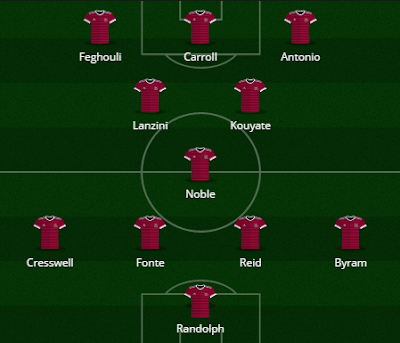 Since Payet has been out of the West Ham squad, they have looked like a completely different team. 6 goals, 1 clean sheet and 6 points in 2 games has seen them rise into the top half of the table, and they have shown no signs of slowing down. A key factor to this success has been the unity that is now evident in the squad, with all players working hard for each other and the team. Over this period, Andy Carroll (£6.3 – TSB 3.9%) with 3 goals, Manuel Lanzini (£6.3– TSB 0.5%) with 1 goal and 2 assists and Michail Antonio (£6.9– TSB 12.1%) with 4 assists have all excelled and it is likely that this form will continue into their GW23 encounter with Manchester City. However, West Ham have only beaten City three times in their past 24 matches, so these players will need to be at the top of their game to get a positive result out of the match. For City, they will be looking to find some form for themselves after poor performances over the past month or so. In particular, their away form has been poor. They have only kept 2 away clean sheets all season, and conceded 4 goals in their last away game, so it is likely that the West Ham attackers will have opportunities to score throughout the game. As a result, it will be vital that City’s attacking big guns stand up and find form. Their FA Cup win over Crystal Palace may have been the game to kick start this form, with Raheem Sterling (£7.7 – TSB 9.3%), Yaya Toure (£7.3 – TSB 1.1%) and David Silva (£8.6 – TSB 2.1%) standing out. Subsequently, both sides will probably play to their strengths (attack), so this match has the potential to be a high scoring one. This match could be closer than most people think. Manchester United have struggled in their 3 matches against Hull this season, and although they won 2 of these matches, keeping a clean sheet on both occasions, they have looked unconvincing. Subsequently, Hull will gain confidence from this, and after defeating the Red Devils in the EFL Cup Semi-Final 2nd Leg, they will know that they can defeat United. It is highly unlikely that Hull will be able to keep a clean sheet in this game, so new signings Oumar Niasse (£5.6– TSB 0.1%) and Lazar Marković (£5.4 – TSB 0.0%) will be key figures in Hull’s attacking play and will definitely threaten the Man Utd backline. Niasse in particular is one to look out for, especially given his performance against the Red Devils midweek, where he netted a goal, had 3 shots on target and hit the post. Thus, Man Utd will need to be at their best to not let the 3 points slip away from them in this match. Subsequently, Zlatan Ibrahimović (£11.7 – TSB 43.4%) and Paul Pogba (£8.5 – TSB 11.0%) will be crucial for Man Utd and they must impose themselves on the match in order for their side to claim a victory. Everton are perhaps the most in form side in the PL at the moment. Undefeated in 5 games, with 4 clean sheets and 12 goals, Koeman has got his side playing excellent football. This period has seen the rise in form of Seamus Coleman (£5.6 – TSB 7.3%), who has been deployed as a right wing back. Also, Romelu Lukaku (£9.6 – TSB 26.3%) with 3 goals and 1 assist, Ross Barkley (£7.0 – TSB 6.2%), who has 1 goal and 3 assists, Kevin Mirallas (£6.1 – TSB 3.3%) with 2 goals and 2 assists and also Tom Davies (£4.4 – TSB 2.0%) who has 1 goal and 2 assists over this period are all worthy of a mention. Coming up against Stoke on a wet and windy night at Bet365.com Stadium in GW23 won’t be a straightforward task though. The Potters too have been displaying top draw performances as of late, and they are without a loss in 3 matches. Pivotal to this form has been Peter Crouch (£4.8 – TSB 4.3%), who has 3 goals and 2 assists in his last 4 games and Xherdan Shaqiri (£6.1 – TSB 3.2%) has also looked threatening as of late. Subsequently, both sides have form on their side and possess match winning players, so this match will be very close. We're now at that point of the season where many FPL managers start to unveil their secret weapon to leapfrog their less prepared mini-league rivals. It’s all due to the prospect of upcoming Blank Gameweeks (weeks where two or more teams won’t have a fixture) and Double Gameweeks (teams having two fixtures in one week). Put simply, the idea is to buy players until after their Blank Gameweeks, and before their Double Gameweeks, thereby maximising their points potential. 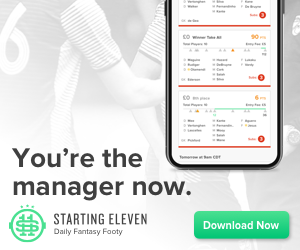 It can all seem a little complicated at first, but with a little careful planning, starting right now, you can exploit any false sense of security your mini-league leader may be harbouring. First things first - you need to make sure that you have 11 active players for GW26. This isn’t as easy as it sounds - Southampton, Arsenal and both Manchester clubs miss out that week, taking some of the most highly-owned players in the game out of contention. The African Cup of Nations (AFCON) has altered Premier League team-sheets and performances since the 14th of January, with players representing their national team at the 31st edition of the biennial tournament. Although some teams were damaged more than others, the loss of key players has significantly impacted the performances of teams, and a multitude of FPL managers were left cursing when their prized assets left FPL behind for a chance to win silverware for their nation. With the AFCON group stage finished and the play-offs underway, a host of Premier league players are set to return as nations are eliminated from the tournament. With players returning, more FPL decisions and selection problems arise and need to be taken into account, as AFCON form could transition over into the Premier League for some players. So, how did FPL assets perform for their nations during AFCON? Always tipped as one of the favourites to perform and go the distance at AFCON, Ivory Coast have had another lacklustre tournament. Gone are the days of the golden generation of players, but looking at the team set-up there are numerous notable names, with many coming from top European leagues. Three star players that Ivory Coast have in their ranks are ever present Premier League players who find themselves in many FPL squads - Wilfried Zaha (Crystal Palace), Eric Bailly (Manchester United) and Wilfried Bony (Stoke). In the group stage, Ivory Coast only managed 2 draws (Togo, D.R Congo) and 1 loss (Morocco), resulting in a third placed finish, thus getting knocked out without even recording a win, scoring a miserly 2 goals while conceding 3. Zaha didn’t show FPL managers anything inspiring to select him upon his return to league, with very little attacking threat presented in the 3 fixtures (0 goals, 0 assists). Starting all three games, Zaha was subbed off on two occasions after not giving his side much value down either wing. This is surprising, as Zaha has been a good differential performer this Premier League season, scoring 4 goals and grabbing 8 assists, getting and assist in every game between GW9-GW13. Crystal Palace desperately need Zaha back to steady their side and aid them in getting out of the relegation zone, and Zaha’s poor form at AFCON might be what the Eagles need, as it might result in Zaha coming back to the Premier League with a bang. Crystal Palace play Bournemouth, Sunderland, Stoke, Middlesbrough and West Brom in the upcoming 5 weeks upon Zaha’s return, which is a very favourable fixture run. Therefore, at a value of £5.5 and with 1.4 shots to go with 4.3 successful take-ons per game, Zaha could be a handy FPL selection. Bailly managed to get 1 clean sheet to his name in a 0-0 draw against Togo, thanks to a good defensive performance. He will most likely slot straight back into the Man Utd defence upon his return, boosting United’s clean-sheet potential. Unbeaten since their loss to Chelsea in GW9, Man Utd and FPL managers should relish the fact that Bailly will be back in the line-up. Bailly was strong on the ball, in the air and when defending 1v1 situations throughout the 3 AFCON fixtures. This is something that Man Utd has missed without Bailly in central defense. At £5.3, Bailly would be a good acquisition for FPL managers looking to gain points from defence. Wilfried Bony received different treatment from his country compared to what he is experiencing at club side Stoke. Bony made two starts and one bench appearance at AFCON managing to get on the scoresheet against D.R Congo. Scoring 1 goal from 2 shots Bony ended the tournament with 50% of his nation’s goals. However, don’t expect this form to carry over to his club upon his return to the Premier League. Although Bony is a good striker and at a value of £6.9, he is reasonably cheap for forward options, Mark Hughes rarely utilises Bony in the first team, opting for Crouch and Diouf instead. Also, with the recent acquisition of Saido Berahino, expect Bony to continue warming the bench for Stoke. One of the favourites to take out the tournament due to the quality and experience in their side, Senegal performed up to expectation through the group stage (2 wins, 1 draw). However, they faulted at the first knock-out game, a penalty shoot-out loss to Cameroon. 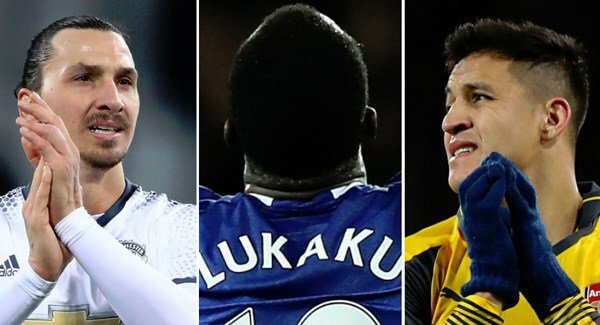 Senegal boast 4 Premier League players who have been consistently starting for their clubs. Idrissa Gueye (Everton), Sadio Manè (Liverpool), Mame Biram Diouf (Stoke) and Cheikhou Kouyatè (West Ham) were all integral parts of the Senegalese set-up. The involvement of Manè is what FPL managers are eager to learn about, as he has been an excellent source of FPL points in the 2016/17 season. Also, Kouyatè is one to look out for as he possesses solid FPL potential in the budget midfield range. Ever since moving to Liverpool from Southampton at the beginning of the season, Manè has been in scintillating form. So far this season, he has scored 9 goals from 2.3 shots per game and has also provided 6 assists from 1.7 key passes per game. This form directly carried over into AFCON with Manè seemingly being unstoppable when in possession of the ball. Over the course of the tournament Manè was the prime attacking threat for Senegal, which the team was built around. Of the 3 games Manè played in, he scored 2 goals from 6 shots and was a constant menace to oppositions in the attacking third of the field, being ranked as one of the best for take-on efficiency among all players. In the quarter-finals match-up against Cameroon, Manè was exceptional, with 1 shot on target, 11 fouls won, 4 crosses into the box and an amazing 14 take-ons. However, the game went to penalties and Manè missed his spot kick, giving Cameroon the victory. FPL managers should consider that this miss may have affected Manè’s confidence. However, it could also do the opposite and give Manè a point to prove upon his return. Even with a tough run of fixtures, facing Chelsea, Spurs, Arsenal and Man City in the next 7 weeks, FPL managers should look to get Manè into their squads as soon as possible. Kouyatè was an invaluable asset to Senegal at AFCON. Playing in multiple roles across the midfield, Kouyatè featured in 3 out of Senegal’s 4 games. He was one of the lynch-pins that aided in securing 3 clean sheets in the tournament by breaking up opposing attacks and constructing play in favour of his side. Similar to his role at West Ham Kouyatè was given the ability to drift up field when necessary, managing 3 shots on target. This season in FPL, Kouyatè has registered 1 assist, which is his only scoring involvement so far. This is a decent drop from the 5 goals and 3 assists he picked up last season, where he also managed a shot frequency of 1 every 66.8 mins from defensive midfield, which is very good. However, now that Payet has left the Hammers, Kouyatè could see a change in roles with him moving further forward, flourishing at the attacking end of the field. As a result, Kouyatè is a player to be considered for FPL due to his price of £5.1, but not a first choice go-to budget midfield option. Going into AFCON, Algeria had a good chance at going the distance, with the style of play and the star power to back it up. However, Algeria quickly became a big disappointment, having 2 draws and 1 loss to be gone at the conclusion of the group stage. The Leicester City duo of Riyad Mahrez and Islam Slimani couldn’t prevent Algeria from being knocked-out, even though both put in some very good performances at the international cup. Mahrez has been in very bad form this season, not being able to continue on from his stellar 2015/16 campaign. Although Mahrez is still Leicester’s highest FPL scoring player, he hasn’t scored since GW13 and has not yet produced a double figure points return for the 8.2% of FPL managers who have selected him. At AFCON however, his form dramatically changed. In the opening game against Zimbabwe, Mahrez scored 2 goals from 6 shots and whipped in 4 successful crosses. Over the 3 fixtures, Mahrez continued to look dangerous in front of goal, having a total of 10 shots at 3.3 per game, much higher than his average 2.2 shots per game for his club. Even against the toughest opposition in Algeria’s group (Senegal), Mahrez managed 5 crosses, 3 shots, 8 take-ons and an assist. This reinforces to FPL managers that Mahrez still has the ability to score points, especially against weaker oppositions. The four times Mahrez has provided FPL points returns of 5+ this season has been against Hull (GW1), Burnley (GW5), Watford (GW12) and Middlesbrough (GW13), all considered weaker opponents for Leicester. Looking at GW29 onwards, Leicester have a kind run of fixtures to end the season, meaning Mahrez could build off his AFCON form and aid in Leicester staying in the Premier league. Nevertheless, at £8.9, Mahrez needs to start scoring goals regularly to warrant a spot in FPL manager’s squads ahead of other midfielders. Just like his club team-mate Mahrez, Slimani finished AFCON with 2 goals and an assist from the 3 games. Like most good forwards, Slimani’s contributions came in and around the opposition’s penalty area - 7 total shots with 3 on target (2 goals). This was a showcase of why Slimani became Leicester’s record signing this season. Although having limited appearances for the foxes since signing, Slimani has still registered 5 goals and 3 assists to be joint top scorer with Jamie Vardy at the club. AFCON has given Slimani a platform to prove to Claudio Ranieri that the money spent by Leicester on him was warranted. Slimani has picked up a goal or assist in 3 of his last 4 games in all competitions and with Algeria not getting out of the AFCON group stage, this form can continue in the Premier league, granted Slimani gets game time. At 1.8 shots per game this season Slimani has been a goal threat and can become a consistent scorer for Leicester and FPL managers if trusted. With less than 1%TSB, if Slimani continues this small patch of form over a longer period of time, it would be nonsensical for FPL managers not to consider bringing in the £8.2 striker. A courageous effort was shown at AFCON by Morocco, finishing second in their group, which boasted the likes of DR Congo and Ivory Coast. After losing the opening fixture against a good DR Congo side (1-0), Morocco went on to claim two victories which saw them make it out of the group and into the knock-out playoffs – losing in the quarter-finals. Morocco only has the privilege of two Premier league players in their ranks, Sofiane Boufal (Southampton) and Nordin Amrabat (Watford). Both on the fringe of the national squad, Boufal saw no match-time (due to injury) at the tournament and Amrabat was very limited. However, there is some positives that can be taken back to their respective clubs sides. Due to a slight ankle injury Amrabat was unable to play any game time at AFCON and is now facing stiff competition from Niang, Success and Janmaat at Wtaford. It is unclear whether Amrabat will jump straight back into Watford’s first team when he returns to league competition. Starting almost every Premier league fixture this season for Watford, Amrabat has had trouble gaining FPL points as his style of play does not necessarily suit FPL point scoring. Amrabat’s wing play has only seen him record 3 assists all season, however, with 1.4 goal scoring chances created per game and 1.3 shots per game, Amrabat has the potential to have a bigger impact. Additionally, Watford’s player of the season so far Etienne Capoue has been the creative force behind all of Watford’s attacks, meaning Amrabat has had a smaller role to play in the side. But, if Capoue gets injured or suspended in the remaining league games, Amrabat could become key to Watford scoring goals. Always one of the stronger African nations at any international tournament, Ghana yet again found themselves as a contender for the AFCON trophy. However, they weren’t at their blistering best, just scrapping through the group stage with 2 goals for and 1 against from their 2 wins and 1 loss. Premier League players, Andre Ayew (West Ham) and Daniel Amartey (Leicester), both contributed to Ghana’s success. Amartey, playing in a very defensive minded midfield role isn’t anyone’s FPL necessity with a mere 0.2%TSB. However, Andre Ayew has been an integral part of FPL squads in the past, and could be once again after returning from international duty. 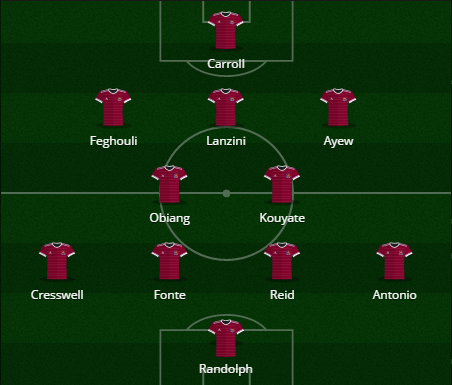 Starting all fixtures at AFCON and playing the full 90 minutes in an advanced midfield role is something that should immediately get FPL managers interested in Andre Ayew’s stock. Ayew has scored 2 goals from 7 shots at AFCON so far and looks to have his confidence back in front of goal, which has been missing at West Ham this season. Formerly, Ayew was a constant goal threat. At Swansea in the 2015/16 season, he registered 12 goals and 5 assists, along with 25 bonus points for his hard work and effort on and off the ball. This effort and energy has been evident at AFCON and could very well carry into the Premier League. With Payet no longer a West Ham player, Ayew will have more emphasis put on his play and contribution to the team. However, competition for starting spots with Manuel Lanzini, Sofiane Feghouli, Michail Antonio and recent signing Robert Snodgrass could jumpstart Ayew’s season to the heights it was at Swansea. With a favourable run of fixtures from GW25 onwards, West Ham players could become hot property for FPL managers as many have very underrated values. Ayew could even find himself partnering Andy Carroll up front, should Slaven Bilic opt for a more attacking setup, thus giving more potential to increase his goal tally upon resuming club duty, and at a value of £7.1, is a reasonable midfield selection if he is a nailed on starter in these positions. Dimitri Payet, like most French players who have graced the Premier League, has an excellent footballing ability. However, off-field drama has been the recent downfall of one of the league’s best players over the last 18 months domestically and internationally. Payet, who moved to the West Ham at the start of the 2015/16 season from Marseille for a reported £11 million, aided the Hammers in having a stellar season, finishing 7th on the league table, contributing 9 goals and 13 assists along the way, while also being head and shoulders above his team-mates for playing threat and creativity down the left wing. This form continued over into UEFA Euro 2016, where Payet was one of the main reasons that France got to the final in their home nation, being directly involved in 5 of Frances 13 goals at the tournament. During last season, despite not playing at a title chasing club, Payet was a superstar, and the excitement he brought to the league was only bettered by Mahrez, Vardy and co. at Leicester. He was brilliant for fans and FPL managers to watch and at a price in the £8 million range, he was an essential element to most squads. How times have changed this season? Payet garnered a £9.5 million FPL asking price from the get go this season and has provided flashes of excellence that were so prevalent last season. However, West Ham are not seeing the same success as a team this time round sitting 10th on the table at the current time, prompting Payet to demand a move away from the club effective immediately. The Hammers are reluctant to sell such a prized asset of theirs unless the right offer were to present itself. However, Payet wants to get out of London at any cost. Over the course of the January transfer window, Payet has been in a war with West Ham management regarding a move. For GW21 and GW22, Payet has not featured in the match day squad, refusing to take the field, citing that he is injured and can’t play for the first team and going to such lengths that he will fake an injury if he is forced to play. This disregard for the team and club has caused quite a stir among the playing group who have lost respect for the French international and would not welcome him back into the first-team fold if a move away doesn’t eventuate and he remains a West Ham player. A dramatic return to previous employers Marseille looks the most likely destination for the unsettled Payet, who is willing to take a wage cut to have the move be pushed through this transfer window. However, West Ham manager Slaven Bilic has already rejected 3 transfer offers from the French club for the 29 year old, the last being a reported £22.5 million. The Hammers have asked for a £30 million fee, however, a fourth offer from Marseille is imminent, expected to be around £25 million which is likely to be accepted. 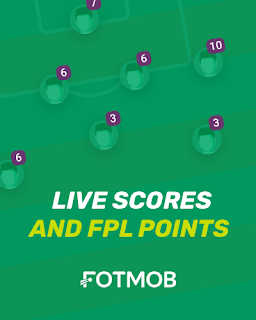 So, what does this move mean for FPL managers? Well, it just might mean a whole lot of good news. Payet (£9.0) is a hefty deduction in squad budget compared to some of his counterparts at West Ham. Although Payet has scored 2 goals and provided 6 assists this season from 17 games with 3.1 shots per game, he hasn’t been as prolific at picking up FPL points as the previous season, only getting double figure returns twice, GW5 against West Brom (10), and GW7 against Middlesbrough (10), with a total of 81 FPL points, ranking him outside the top 20 best performing midfielders. Subsequently, there many cheaper priced options providing far better returns. Team-mate Michail Antonio (£6.9), who has been operating from the opposite wing and also right back this season, is the equal 8th best midfielder FPL wise with a total of 109 points so far from his 21 appearances in the league, contributing 8 goals and 6 assists. As a result, Antonio ranks 1st among all West Ham players for FPL points this season. Antonio also unleashes 2.9 shots per 90mins, similar to Payet, however, attempts more take-ons (4.8) per game than Payet (4.3). Since the absence of Payet on the team sheet for the past 2 GWs, West Ham have had 2 impressive wins, albeit against poor opposition (Crystal Palace and Middlesbrough). However, Payet’s attacking creativity hasn’t been missed with the midfield workload being placed on the shoulders of Michail Antonio and Manuel Lanzini along with the striker Andy Carroll. These players stepped up with team unity seemingly sky high without the drama fuelled Payet as a distraction. Over the course of the 2 games, Antonio recorded 5 shots, 8 from 9 aerial duels won, 4 successful tackles and 4 assists, amazingly 3 in one game against Palace, racking up 20 FPL points in the two games. Lanzini also had 5 shots (1 goal), 7 successful take-ons and 2 assists, to go with 4 bonus, providing FPL managers with 18 points for the two matches. The third player, Andy Carroll got back his goal-scoring touch, scoring 3 times from 8 shots while also showing his aerial prowess winning a staggering 14 of 17 aerial duels, gifting FPL managers with a hefty 18 points over the two fixtures. 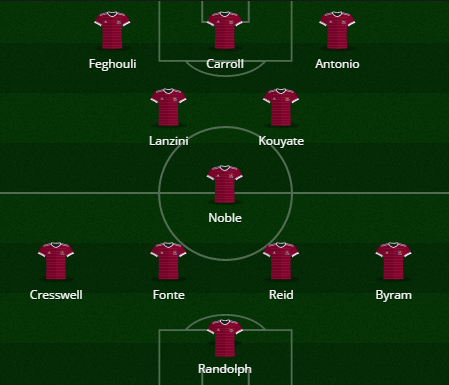 Without Payet in the West Ham line-up, other players are taking on bigger and more cohesive roles to pick up the victory and 3 points, rather than all the attack going down the left wing. Slaven Bilic has a few possibilities after the eventual Payet departure from the club. He can attempt to bring in another player before the window closes to fill the void on the left side of the field, or he could promote fit again Sofiane Feghouli to a permanent starting position. For FPL managers, Feghouli as a nailed on starter could be very enticing. With a £5.0 price tag and a 0.7% TSB, while operating virtually in the forward line but listed as a midfielder, how could anyone resist selecting him. Feghouli hasn’t featured much this season due to injury - 350 minutes of game time, however, does possess the ability to become a new version of the Payet we saw last season. Feghouli moved to West Ham at the start of this season on a free transfer from Valencia, where the 27 year old Algerian was a regular starter and top performer for the club, scoring 20 goals and providing 30 assists in 141 games. 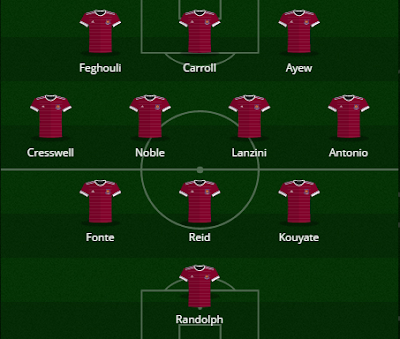 If players like Feghouli, Antonio, Lanzini and Carroll can play regularly and remain fit and healthy and continue to link up successfully, we could see West Hams season turn around beneficially for the club and for FPL managers, as many Hammers players have the ability to perform well above their price tags.